Gong will release their latest album Rejoice! I’m Dead on September 16. The psych-rock outfit are putting out their 28th title – and their first without founder Daevid Allen, who died of cancer last year aged 77. 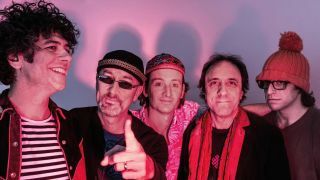 The record also includes an early song idea rehearsal featuring the late singer, along with Gong alumni Steve Hillage, Didier Malherbe and Graham Clark. A clip featuring guitarist Hillage can be heard below. Rejoice! I’m Dead is available to pre-order on CD, LP and in a deluxe editions on the band’s website.